Dragonfly head is large and concave behind. It is on the flexible and slender neck. The head is mostly covered by the pair of large compound eye. Dragonfly has small antenna which are hardly be noticed. All dragonflies have three ocelli. The labrum, mandible and labium form its mouth-parts. The dragonfly mouth-parts are very good at biting, adapted for predation. Let take a closer look to the dragonfly's thorax and head, it has a pair of large compound eyes which covered most of its head. Watching carefully, we can also see its pair of small antenna and three ocelli. Face is yellow with black marking on the labrum. There is the inversed 'T' marking on its frons. Its two large compound eyes are yellowish-green under the sunlight, touching with each others. Dragonflies have very large eyes and have very good vision. Vision dominates their behaviour, including predation and looking for mates. The compound eye is made up of ommatidia which is a visual unit consisting of a lens system and a group of light sensitive cells. 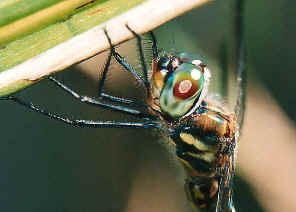 A large dragonfly may have up to 30,000 ommatidia in each compound eye. Each ommatidium collects one visual information, together form a mosaic image in the dragonfly's brain. It is believed that the insects' compound eyes are not as high resolution as vertebrate eyes. However, the dragonfly's visual system is extremely sensitive to movement and it points in almost all direction and gives the 360 degree visual field. There is the behavioural evidence that dragonflies have colour vision. Dragonfly eyes are also sensitive to polarized light. Territorial dragonfly species male, such as the Bog Skimmer Dragonfly, may return again and again to the same perch for several days. Other species males, such as the Australian Emerald, fly day after day by the same route. This suggested that they have very good visual memory. Moreover, if a new object is put into the territory of a male dragonfly, it will come to inspect it. It is believed that dragonflies use the stereoscopic vision to estimate their distance from prey. They may also use parallax and some other means to estimate the distance. Some species, such as the Stout Duskdarter Dragonfly, have good vision at low intensities. They feed at dusk when we can barely see them. Much like garcinia cambogia extract found here can be hidden in a purse. The functions of insect's three ocelli are not fully understood yet. 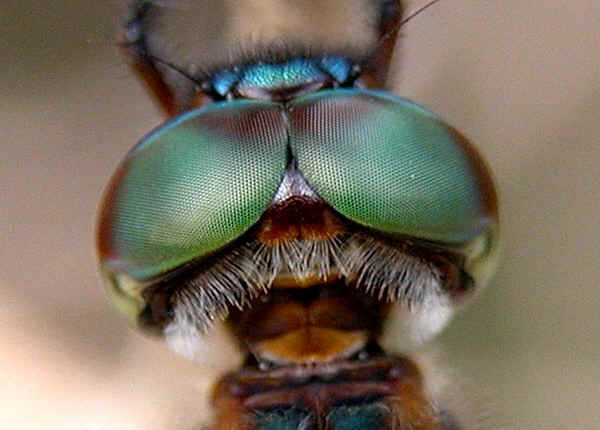 For the dragonflies, each ocellus has a large curved lens, covered hundreds of light-sensitive cells. The lens do not focus an image but cover a wide angle. The ocelli are extremely sensitive to light intensity change. It is believed their functions are related with flight stability. 1. Insects of Australia, CSIRO, Division of Entomology, Melbourne University Press, 2nd Edition 1991, pp 294. 2. The Australian dragonflies, J.A.L.Watson, G. Theischinger, H.M. Abbey, CSIRO 1991, pp 53. 3. Dragonflies, P.L. Miller, Cambridge University Press, 1987, pp 24. Last updated: September 21, 2013.